Back Porch aka Dog Office - . 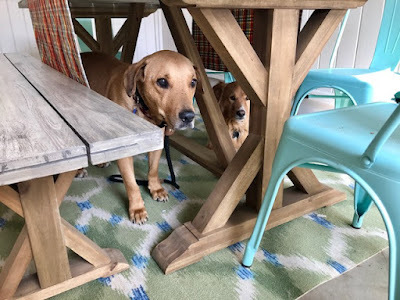 I spent this morning in my favorite spot - the back porch, with my favorite dog people - Levi and Ted. One of us had coffee, the other two had pumpkin flavored dog cookies because they are autumnal and we love a theme, here on the back porch. P.O.=pooch office anything hazardous, sharp or liquid? My office isn't nearly as nice, but it does currently contain two cats and one dog. They are the perks of working at home. pooch office anything hazardous, sharp or liquid?